On the contrary, Maronite and Melkite rite Catholics, who use Arabic in their liturgies, say it too. Yup and there are Syrian and Chaladeons Catholic as well. All those "principled" conservatives just agreed to pay Muslims to NOT work five times a day. But a Christian taking an hour an a half lunch is a slacker. Conservatives and libertarians are worse than useless. They are actively helping enemies of civilization. Conservative: "Everybody's free to do what they want until it makes me go 'Ewww'!" Libertarian: "I don't want to pay taxes. Now let me cobble together an ex post facto justification." Charles Martel tested, Charles Martel approved. This is not because Republicans are more anti-Christians than Democrats as you seem to imply. 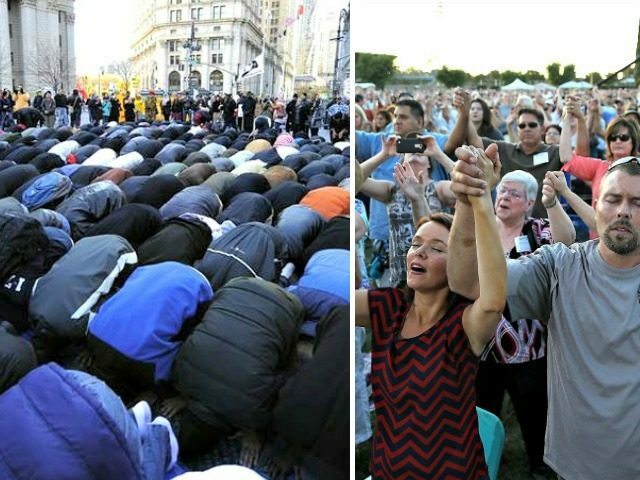 Nearly 70% or the Democrats want to provide a prayer space for Muslims. 45% for Christians. With Republicans, 60% realize the workplace is not a church and they don't need to provide a prayer room for ANYBODY. >Unassimilable Muslims continually shipped into Midwestern towns. >A federal law making it illegal for American citizens to voice support for--let alone participate in--a boycott of Israel. >Christians banned from all major online platforms while ISIS and AntiFa kept their Twitter and Facebook pages. The Republicans aren't necessarily anti-Christian, but they are not allies of Christianity.